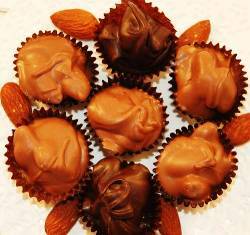 Crunchy, fresh almonds drenched in delicious Dorothy's Swisschocolate. Nice big pieces of almonds, generously used throughout each piece. Our almonds are roasted especially for us in Pittsburgh's famed Strip District. Always fresh! From karen wiley of virginia beach, Virginia on 11/23/2014 . From Tim of Sam Diego, California on 2/26/2012 . From Anonymous of PICAYUNE, Mississippi on 12/12/2011 .